Corsair has teamed up with Ubisoft and AMD to gift one of their fans with a brand new custom made gaming PC! 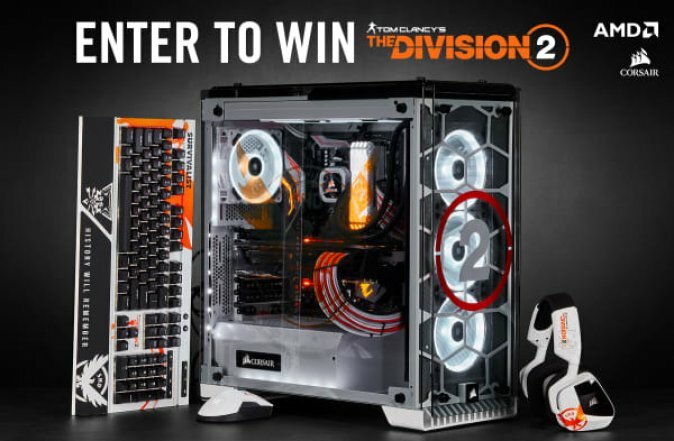 To enter in their latest Custom Tom Clancy’s The Division 2 Gaming PC Giveawaygrab your free entries by following few simple steps listed down below! he CORSAIR K68 RGB ultra-durable mechanical keyboard combines vivid per-key RGB backlighting, up to IP32 water and dust resistance, and 100% CHERRY MX key switches. Create stunning dynamic lighting effects and game-changing macros in CORSAIR Utility Engine (CUE) software to match your style and give you an in-game edge. Dedicated volume and multimedia controls allow you to adjust your audio without interrupting your game, and 100% anti-ghosting with full-key rollover guarantees your commands and simultaneous keystrokes always register. A dedicated Windows Key Lock mode ensures interruption-free gaming, while a removable wrist-rest provides optimal comfort however you game. Whatever happens while you game, you’ll be able to play on. Winner will be contacted via email the week of contest ending and has 48 hours to respond or new winner will be picked.